With the first front-row seeding race of the 2018 FNB Dusi Canoe Marathon on the horizon, Banetse Nkhoesa and Alex Masina will be lining up for the Ozzie Gladwin Canoe Marathon this Sunday eyeing a spot on the podium. 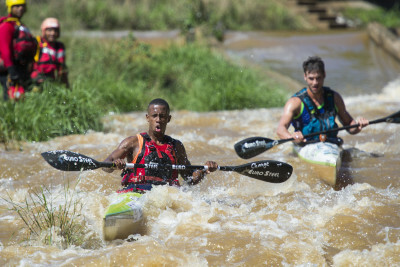 Shongweni-based Nkhoesa, who paddled to an impressive second in the 2016 Dusi with Sbonelo Khwela,has the credentials to take top honours at the prestigious three-day race from Pietermaritzburg to Durban in February, however he is still in the market for a Dusi partner. Despite him teaming up with 2017 Marathon World Championship bronze medallist Masina this weekend, this is a short-term partnership due to an injury that Masina is carrying at the moment. “We won’t be paddling Dusi together because Alex has got a knee injury,” Nkhoesa mentioned. “Unfortunately we haven’t had much time to train together and got in a boat together for the first time last Thursday. “I am excited to paddle with him as he is an incredibly strong paddler but with a long portage to finish the Ozzie we will have to take it easy. “We want to paddle as hard as we can and then take it easy on the run. So hopefully we are in a good position by the time we get to the portage,” the Euro Steel athlete added. The build-up to the Dusi might not be going as smoothly as Nkhoesa would like as he continues his search for a partner, but he is still focusing on each race as it comes and continuely trying to improve. “I want to do as well as I can at every race that I take part in, and with the Ozzie being our first big race of the season I want to perform as well as I can. “After Ozzie I want to have a partner for the Dusi sorted out so we can start focusing on our preparation and the other major races in the build up to Dusi. “There are a number of big races and I want myself and my partner to be ready for 50 Miler and Campbell’s to Dusi Bridge as that is the last big one before Dusi,” he commented. Nkhoesa is unsure as to who he and Masina might be up against this weekend, however he knows it will be a strong field. “I am sure that Sbonelo (Khwela) and Siseko (Ntondini) will be there and they are going to be a strong combination as will Mthobisi (Cele) and Mpilo (Zondi). “There is always a strong field for the Ozzie Gladwin and I am really looking forward to getting back on the river in a competitive environment,” he added with a smile. Altough Masina’s flat-water credentials are highly impressive, his river paddling is also notable having won the Under 18 title recently at the Fish River Canoe Marathon with Stewart Little. The 2017 Ozzie Gladwin Canoe Marathon takes place from Camps Drift to the Bishopstowe Hall on Sunday 26 November.